Despite that the current US president pulled out of the Paris climate accord earlier this year, former vice president and current activist, Al Gore, still says he comes down on the side of hope. 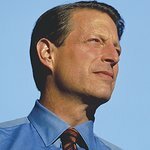 Following his 2006 documentary, An Inconvenient Truth, about the effects of global warming, Gore released a follow up documentary last month called An Inconvenient Sequel: Truth to Power, which speaks to the human ingenuity that is behind his hope. He cites other signs of hope as well. “Electricity from the sun and the wind is now in many regions much cheaper than electricity from dirty fossil fuels,” says Gore. "Electric cars are becoming affordable. Batteries are coming down very quickly in cost and, coupled with renewable energy, will utterly transform the world’s energy systems. The question is, will we?.